What makes a good advertising agency? Be careful of what you wish for because you might just get it. Munnee seems to have gotten the right strategy this time round. His only problem is failure to be specific about what exactly is needed for his new Nail Salon business. I wouldn’t blame the advertising agency personally because they seem to have fulfilled Munnee’s demand/request. Just like the computer term “garbage in garbage out!” The question is who is to blame? In this competitive world regardless of the nature of the business, advertising is a key tool needed to push your product on the market. Let’s put it this way, without advertising no one might know about your product. The emergence of new businesses by the day requires proper advertising tools and expertise so as to compete against the old ones that have been in the game for sometime. On the other hand there has been a significant rise in the number of advertising agencies. These have also emerged because of the ever rising need to advertise both new and old companies regardless of the nature of the business. First thing first, do you need an ad agency? Many small businesses start out with the entrepreneurial motive so they rely on their own abilities and the skills of their own staff for in-house advertising and marketing needs. But for most progressive and rising companies, a partnership with an advertising agency is inevitable because sooner or later the company has to grow. Before setting out to search for an ad agency small companies should think critically about how the advertising agency would boost your business considering the objectives. Search for the available Advertising Agencies in the market. These ad agencies come in different packages. So first, consulting your peers is one way to go about it. Then you can do some research and find out whom most companies and corporations are using to do their advertising and marketing. Look into newspapers, radio stations, magazines, business directory etc. These will narrow down down your search or even hand you the right advertising agency. Then write a Request For Proposal. This is the easiest way to assess your company and advertising objectives. This will also give you a detailed insight of your financial requirements. While doing so it is important to understand your business model and your customer/client demographics. This helps paint a realistic picture because no one understands your business and clients better than you do. The selection phase/meetings with the ad agencies. Once you have narrowed down your advertising agencies, together with your colleagues you can start conducting meetings with these advertising agencies. There are some important factors that should be addressed even before the meeting can commence. Understanding the legal technicalities is really important and should be discussed in the first meeting with the ad agency. These include non-compete clause, idea of ownership, and fees. Once these discussions are out of the way you may then continue with the creative discussions. Listen to what that agency has to to offer, these first meetings are usually referred to as capabilities meetings. It is here that these advertising companies display their power of creativity. To assess the skills of these agencies, ask for case studies of their past projects. In this case size matters. It always better to opt for smaller advertising agencies. It sounds ironic but here is the reason why smaller is by far much better, they provide you with a personal and more creative approach. Small and good ad agencies will be excited to take you on board that way they will gladly execute any creative challenges thrown at them. Those big ad agencies tend to serve the big and established companies before the the smaller ones so it is better to go for the smaller ad agency that will handle your advertising needs. Search for a full Service Advertising Agency. The process of searching for an advertising agency is really tiring and time consuming so once you set out to find one, it is advisable to get an all rounder. Get an ad agency that provides the following services: in house media planning and buying, radio advertising, as well as print, web design and public relations. They should also have full marketing support. 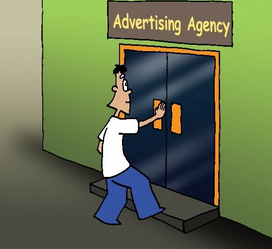 Opt for advertising agencies that provide both press and outdoor advertising concurrently. Like most industries in the futuristic world, advertising drastically changes by the day. There are so many options and variables that the advertising section has become increasingly much harder and competitive. Never the less advertising is still very important to both big and small companies regardless of what they specialise in. In other words, advertising promotes healthy competition in business.